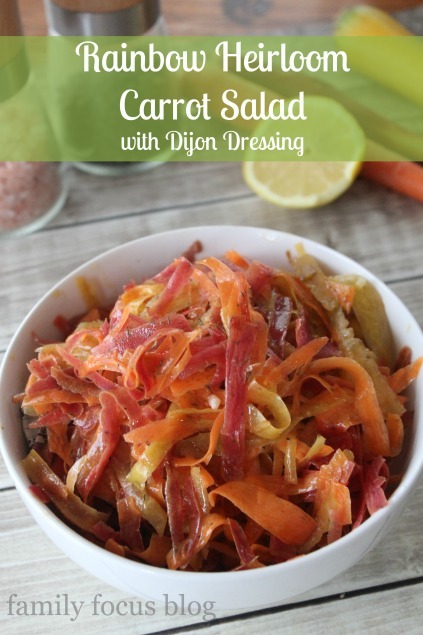 If you are looking for a light, delicious and pretty side dish for Easter or any other occasion this Heirloom Rainbow Carrot Salad with Dijon Vinaigrette fits all of those requirements and then some. It is a great recipe to carry you through spring and all of summer to picnics, barbecues, and family gatherings with its bright flavor and versatility. 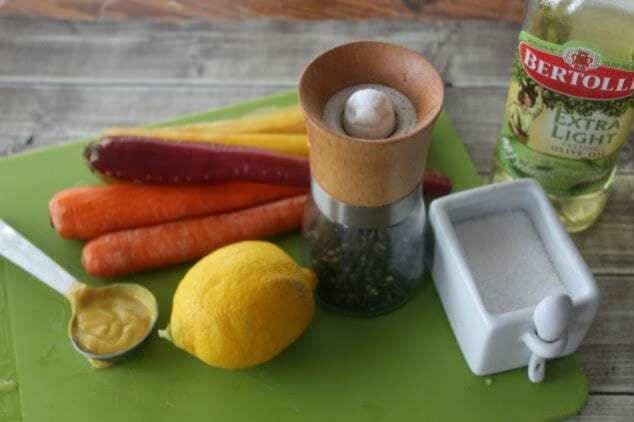 This easy carrot salad recipe will work just fine for any type of carrots but these heirloom rainbow carrots I found at Trader Joe’s make it extra pretty. This recipe just takes a few wholesome ingredients and and few minutes to make. Wash and peel your carrots well. Cut off and discard the tops and bottoms of the carrots (about 1/2″). Cut the carrots in even thirds so that your carrot salad is easier to eat. Use a peeler and with small, short strokes grate the carrots into a bowl. You can use a regular grater if you prefer. I just prefer the long thin texture of the carrots that the peeler creates. 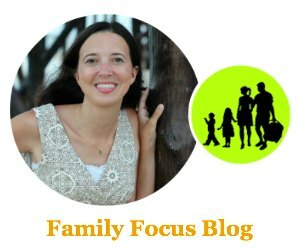 In a separate bowl whisk together the lemon juice, mustard, oil, honey, salt , and pepper until well combined. You can add more or less lemon juice and honey to adjust to your taste. Taste the dressing and then readjust until you love it. 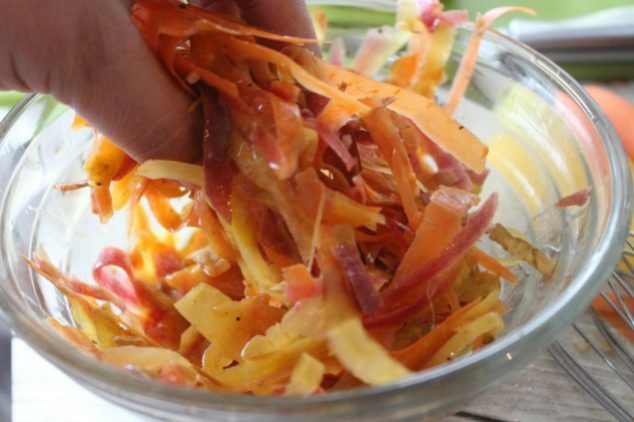 Pour mixture over shredded carrots and stir or mix by hand to coat until it is well coated with the dressing. Refrigerate before serving for at least an hour for best taste results. Mix the salad again after chilling. Before serving sprinkle with a couple of pinches of minced fresh dill to bring out all the flavors. 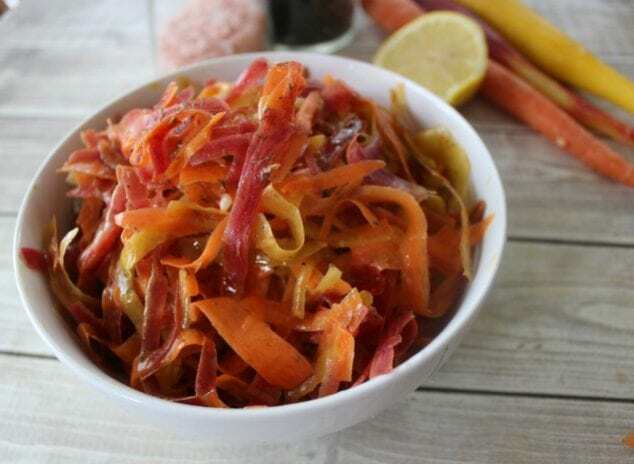 Easy heirloom carrot salad recipe. Wash and peel your carrots well. Cut the carrots in thirds. Use a peeler with small, short strokes to grate the carrots. 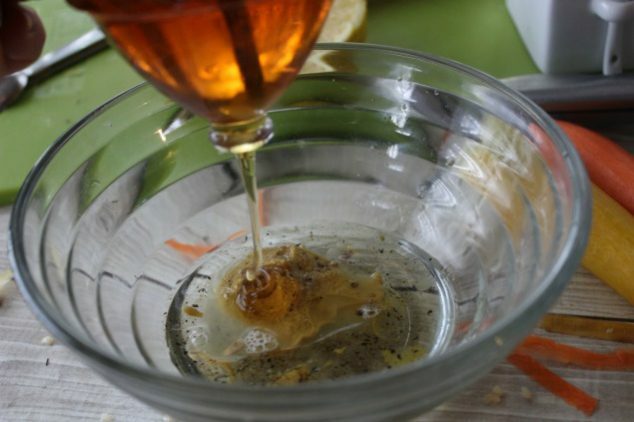 In a separate bowl whisk together the lemon juice, mustard, oil, honey, salt , and pepper until well combined. 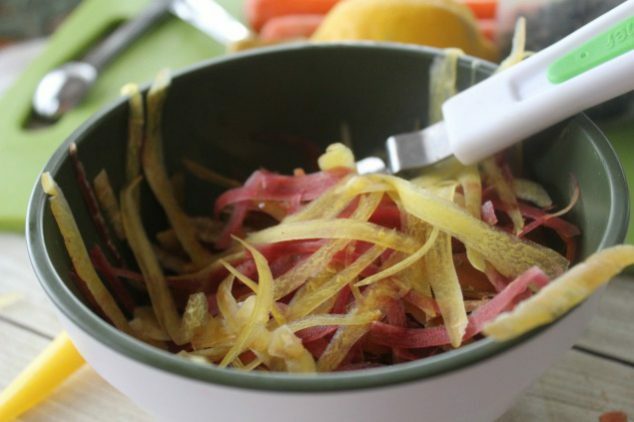 Pour mixture over shredded carrots and stir to coat it well with the dressing. Before serving sprinkle with a pinch of fresh dill to bring out all the flavors. I hope you enjoy the fresh, bright flavors of this easy carrot salad recipe. It is a great way to enjoy a something fresh and healthy with foods like burgers, pulled pork, or grilled chicken. What do you think you will serve with your heirloom rainbow carrot salad?